Thanks to The JEA Model Editorial Policy and The Kirkwood Call for guiding us through this process. The BHS Media Editorial Policy pertains to all BHS media, including the newspaper, The Eagle Way; the yearbook, and the website, onlyoneagleway.com. The full editorial policy is available on onlyoneagleway.com. BHS Media are the official student-produced media of news and information published/produced by BHS Media students. BHS Media have been established as designated public forums for student editors to inform and educate their readers as well as for the discussion of issues of concern to their audience. It will not be reviewed or restrained by school officials prior to publication or distribution. Advisers may – and should coach and discuss content – during the production process. Because school officials do not engage in prior review, and the content of BHS Media is determined by and reflects only the views of the student staff and not school officials or the school itself, its student editorial board and responsible student staff members assume complete legal and financial liability for the content of the publication. The editorial board decides on all decisions that pertain directly the BHS media and their interests. Guides the media in accordance with approved editorial policy and aids the educational process related to producing material. Will submit student media produced by the students to rating services and contests in order for the school publications staff to receive feedback. The Broomfield High School administration will provide the students of BHS with a qualified journalism instructor to serve as a professional role model, adequate classroom equipment, and space for a sound journalism program. BHS administration will offer equal opportunity to minority and/or marginalized students to participate in journalism programs. BHS administration is not required to view and approve publication content before publishing. The staff of BHS Media will strive to report all issues in a legal, objective, accurate and ethical manner, according to the Canons of Professional Journalism developed by the Society for Professional Journalists. The Canons of Professional Journalism include a code of ethics concerning accuracy, responsibility, integrity, conflict of interest, impartiality, fair play, freedom of the press, independence, sensationalism, personal privacy, obstruction of justice, credibility and advertising. 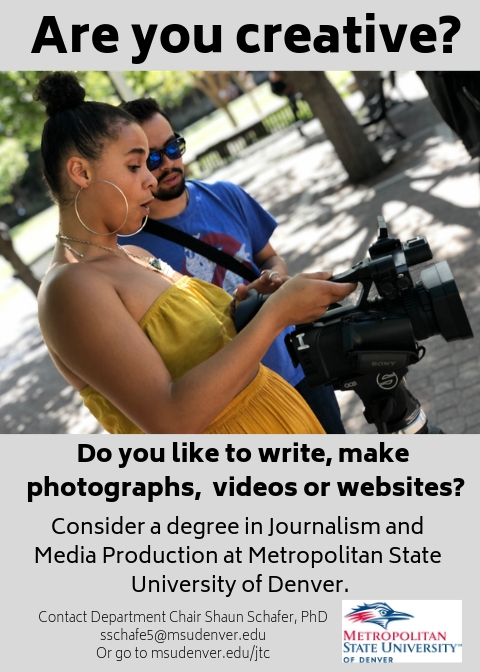 All writing in the media, other than letters to the editor, will be written by students of the journalism program and will not be accepted otherwise. BHS students outside of the media staffs will have the opportunity to submit writing to the media. Writing must be the original work of the writer and not previously published on any publication, unless otherwise specified by the adviser and EICs. All articles, graphics, photos, art, columns, pages, reviews, and other material creatively conceived, with exception to staff editorials, mug shots and cutouts will be bylined with the producer’s name. The media will specialize in and emphasize on informing their readers of school news and unique students of the Broomfield High School community. The media will publish factual information (date of birth, date of death, survivors, organizations, hobbies, interests) in a 300-400 word obituary including one mug shot if possible in The Eagle Way and onlyoneagleway.com. The school yearbook will publish factual information (date of birth, date of death, survivors, organizations, hobbies and interests) on one page after the respective grade of school pictures in the reference section. REGARDING ILLUSTRATIONS, PHOTOGRAPHS, GRAPHICS, ETC. All captions will record the who and other necessary information in the photo. Artwork represents the interpretations of the artist, not necessarily of the staff or BHS. All advertisers will receive a complimentary issue of The Eagle Way in which their ad has run. Bills which are not paid by May 1 will incur an additional fee of 30% of original balance. An additional fee or 30% the original balance will be added the first of each month until the bill is paid. The school newspaper will be distributed free of charge to all students according to a distribution schedule approved by the adviser and editors. Newspapers will be distributed according to our ability to fund printing. Current copies of the school newspaper will also be displayed in the library, main office, guidance office, newspaper racks and in SJ. The paper will be distributed during homeroom. The school newspaper will accept subscriptions for the price of $50 for the entire year. Total press run each issue is approximately 1,800 unless specified otherwise by adviser or editorial board. The school yearbook will come out during registration for the following school year, unless specified otherwise by the adviser and editorial board. Portraits provided by the school photographer will be used for students in grades 9-12 and for the faculty members. Because of plant deadlines and the possibility of students missing portrait day, the yearbook staff is not responsible for unavailable portraits of students. Photo omissions will only occur for students or faculty with written permission by the student and a member of the administration. Editorial board reserves the right to review or omit questionable or inappropriate portraits. Yearbook will cover school sponsored, board approved, and established clubs/sports. All other sports or clubs will be reviewed by the editorial board. Portraits will consist of group members and sponsors only. Props are not permitted without prior approval. Guidelines to write letters to the editor will be printed every issue in the opinion section of the paper and available online at onlyoneagleway.com. Letters to the editor may be submitted to Mr. Lay’s mailbox, or emailed. Letters to editor should not exceed 300 words, must be signed and must include writer’s email or phone number for verification. No material will be printed where content is obscene, invasive of another’s’ privacy, encouraging physical disruption of school activities, and/or implies libel. The BHS Media editorial board reserves the right to withhold a letter or column or other submission and/OR return it for revision if it contains unprotected speech or grammatical errors that could hamper its meaning. Deadlines for letters and columns will be determined by each year’s student staff, allowing sufficient time for verification of authorship prior to publication. Online comments will require a name and email address submitted that are verifiable. Alerts will be sent to staff editors each time a comment is posted to the site. Review ideas may be submitted to the editorial board by all members of the BHS media. Social media will be used to promote BHS media, to promote published content and to engage the BHS community. 1. The goal of the media marketing is to promote and expand the media viewing audience. 2. The publicity team will work with all aspects of the media. 3. The publicity team will work to attend all major events held by the district or school with the intent of promotion. 4. All events or important dates known by adviser, staff members or editorial board will be passed along to the Social Media. 5. Ad trade-outs are regulated by the Business Editor, ad trade-outs are given on a 1 for 1 basis. 6. The Social Media Editor will work with the web team to promote the publication through outside sources such as Facebook or Twitter. Sources will not be able to arbitrarily demand to read the reporter’s completed story and then perform editing tasks on that story. All students and staff of Broomfield High School are eligible for publication in the BHS student media. All efforts will be made to keep students and staff who have ‘opted out’ of coverage from publication in the BHS Media. New and returning staff are judged by application, previous work, potential and perquisite class work. Staff applications are due in January of each year prior to registration. The staff and editors are selected prior to registration each January. The adviser reserves the right to make changes to the list as he/she deems necessary after the registration deadline. 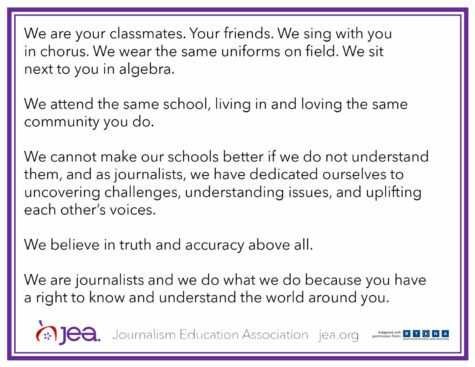 The BHS media is a member of JEA.